Here are a couple of examples where people have thought about a problem differently. What would happen in your organization if you were to think differently? The other night I bumped into a retired customer of ours. I was carrying three pizzas and listening to a podcast in one ear when a man opened the door for me and asked how I was. My quizzical look told him that I didn’t recognize him right away. Once he told me his name, my mind made the connection. In the context of the customer’s building, I would not have had that problem. This shows how important context is. In the context of journalism, accuracy refers to getting the details correct. In archery, it means hitting the middle of the target. In manufacturing, it means the machine creates parts with dimensions matching the design drawings. In metrology, it means having minimal variation from a standard. This one word takes on different meanings depending on context. A reliable journalist is one who shows up consistently and does their job. A reliable archer practices on a set schedule and doesn’t miss events. A reliable machine produces parts, often day and night, without stopping. A reliable gauge measures consistently from day to day and operator to operator. The comedian Larry Miller has a joke about meeting teachers after you’ve graduated, and still referring to them as “Mr. Cooper” instead of by their first names. Sometimes, context stays in place even after the circumstances have changed. My wife works in a daycare and teaches in her church. There have been times where we’ve been in a store and one of her current or former students has bumped into her. They get that same “Where do I know you from?” look that I must have had. In a classroom, they know who she is. In Target? Not so much. I see these situations as a reminder that context plays an important role in how we see the world. Keep that in mind when interacting with people. They may come at a situation with a different context, which can lead to some conflict. Ask any business founder why they started their company and you’ll hear about a product or service. They will tell you about a moment of inspiration. Or, maybe you’ll hear about a long path of research. If you ask them what the purpose of their business is, you might hear, “To make money.” If pressed further, they may say, “To service clients,” or “To solve a problem.” These are all good motivations for a company. But, there is one phrase that should send a chill down your spine when you hear it. Now, I’m not suggesting that shareholders shouldn’t get value from their investments. I’m not saying that a business shouldn’t try to be profitable. What I am saying is this. If a business focuses on “maximizing shareholder value”, the business isn’t focusing on why it started in the first place. Shareholders don’t provide revenue. Customers do. Focusing on the shareholders often comes at the expense of the customers. When a business focuses on shareholders, it has lost its primary purpose. Consider the case of the Comcast customer who tried to cancel his service only to have the Comcast agent accost him. Search for “rude gate agent” and you will find stories of poor service at airports. In many of these cases, workers are doing what their training tells them. These agents train to keep customers, cut costs, and improve the bottom line for the company. Yet, in the long run, they only succeed in driving a customer away. I think it should be obvious, but the solution is, focus on the customer. Think about the customer’s needs. Put yourself in the customer’s shoes. Don’t worry about paying a dividend or pushing the stock price up. Those things will happen when satisfied customers become return customers. Cutting corners to raise the value of the stock may work in the short run, but it is unsustainable in the long run. What does this picture say about the company where it was taken? If you only saw this picture, what assumptions would you make about the condition of equipment in the plant? What do you think the behavior and attitudes of the employees would be? In today’s current climate of increased quality and global competition, having an intelligent and skilled workforce is a must. If none of the employees has the basic language skills to see this error, I wonder how well they communicate with each other, and what their attention to detail is like. Maybe they thought it was too small an issue to bring up. Maybe they thought the supervisor would get upset with them for pointing out the error. Maybe they thought their coworkers would give them grief for being the spelling police. Regardless of what the reason was, I don’t see it as a good situation when someone would see a problem and not say anything about it. What if a machine has an issue that isn’t a critical problem, but could grow into one? Will someone speak up before the machine breaks down completely or hurts someone? This scenario is the most troubling to me. If you want employees to feel empowered, you have to take their feedback and act on it. If someone brings up a little issue like this that wouldn’t take but a minute to correct, and you as a supervisor ignore them, what are the chances they’ll bring up a bigger issue? What motivation would the employees have to do anything that would benefit the company? While I’ve been in school, I’ve had the opportunity to visit some manufacturing facilities. I’ve been in some places where you could literally eat off the floor. The buildings are bright, clean, and well maintained. I seriously doubt I’d ever see a sign like this one in one of those places. In comparison, the building where this sign is posted is a bit dark, quite noisy, with cluttered areas and work stations. Maybe I’m making a big leap, but it seems to me if you’re not willing to get the little details right, you’re not going to get the big picture right either. Often, you’ll hear people say that they’re not good at problem solving. The issue with that, in my opinion, is that they’re simply not framing what it means to be a problem solver the right way. Something as simple as realizing you’re out of milk in the fridge can be classified as a problem solving venture. You recognize there is a situation that needs corrected. You have to decide if you’re going to go to the store just to get milk, or if you’ll turn it into a full shopping trip. If you make it a full trip, you have to go through the kitchen and take inventory of other items that need purchased, prepare a list, possibly gather coupons. Then you get to leave the house. That’s where the life and death problem solving begins. Assuming you have a vehicle to drive, you have to decide which store you’re going to, plan a route, then navigate that route. All the while, you’re negotiating with countless other people solving their own problems, often at high speeds, surrounded by two to three tons of steel and combustible fuel. Anyone who has driven anywhere has solved more problems than they can imagine just to get from point “A” to point “B”. Once you get to the store, you’re still not out of the woods. Find a cart that doesn’t wobble, that’s big enough to hold all your stuff, but not so big it’s unweildy. Now, for each item on your list, figure out where that item is in the store. Compare it to the other similar items to find the best buy. Place the items in the cart, being mindful that you don’t want to put a 50 pound bag of dog food on your carton of eggs. Then get to the checkout, unload the cart, decide how to pay for all your stuff, load it into the car, and go through the life or death return trip home. 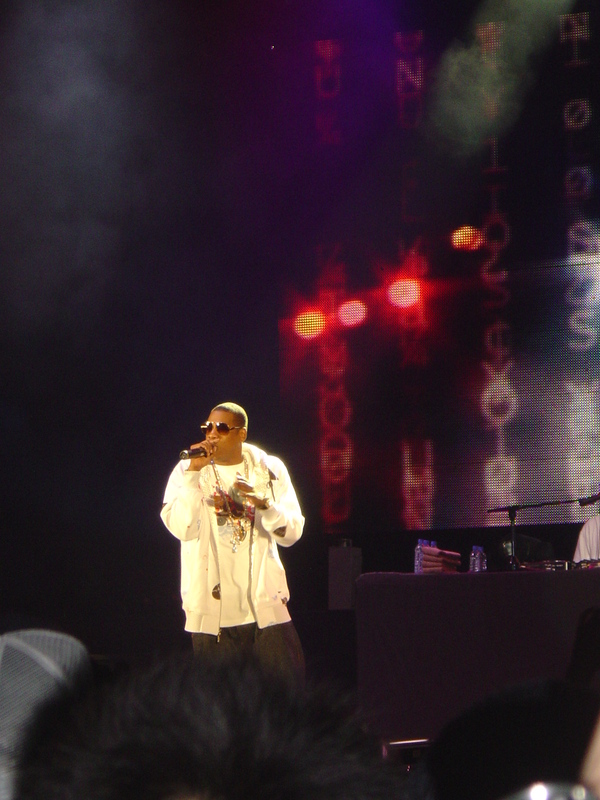 “Jay-Z concert (cropped)” by i am guilty – JAY-Z, original resolution. Licensed under CC BY-SA 2.0 via Wikimedia Commons. Anyone who thinks they only have 99 problems isn’t really thinking about what problems they solve every day. Don’t sell yourself short. You’re better at problem solving than you think you are.